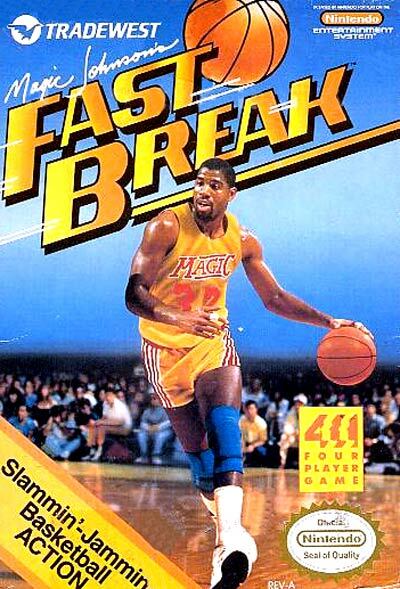 Magic Johnson's Fast Break is fast-paced two-on-two action rather than the usual five-on-five contest. On screen you get a full-court, horizontally-scrolling gameplay. A referee monitors the action and calls the fouls if the gameplay gets too rough, and a crowd cheers you on. Your team starts each game at a certain salary level. Your goal is to beat the opposition to earn a larger salary. Keep winning and you might etch your name onto the Big Earners Screen. Choose from five skill levels - Rookie to Professional. Each level provides quicker gameplay, tougher defense, and bigger bucks if you win. Each game lasts four three-minute, real-life quarters. In between quarters, you can review stats such as field goal percentage, three-pointers made, rebounds, and steals. If the score is tied at the final buzzer, you play additional quarters until someone wins. You control one player at a time. An arrow appears on-screen above the head of the player you're running. Just hit B to switch players. You can play against the computer or up to three friends.